When the culinary intelligentsia and critics catalog the myriad culinary wonders produced by the American dessert-masters known as the Pennsylvania Dutch, the country fair-nosh known as “kettle corn” is consistently ignored. And that’s messed up because the idea of popping corn in a sugar syrup, which then forms a thin, candy coating perfectly balancing the texture and flavor of the corn (the exact salty/sweet gestalt that makes bacon bacon) is a profound expression of genius. Temperature control is key and the eponymous vessel goes a long way toward making this miracle possible. As I don’t own a large copper kettle, I employ a slightly unorthodox method, which entails popping a small amount of corn and using that audible as a prompt to add the remaining kernels along with the sugar. It’s not an elegant hack, but it gets me where I want to go, back to the windy roads around Lancaster, Penn. Oh! And watch out for the buggies. Place the oil and a few popcorn kernels in a 6-quart metal mixing bowl. Cover with heavy-duty aluminum foil and poke 10 slits in the top with a knife. Place the bowl over medium-high heat and shake constantly using tongs to hold the bowl. Once the kernels pop, carefully add the remaining kernels, sugar and salt. Re-cover the bowl and return to medium high heat. Continue shaking constantly until the popcorn finishes popping, about 3 minutes. Remove the bowl from the heat and carefully remove the foil. Stir in the chili powder. Cool for 5 minutes before devouring. *There are essentially two varieties of popcorn: snowflake and mushroom. Mushroom popcorn pops smooth and round and kind of resemble the tops of mushrooms. I like this type for kettle corn because the smooth, firm texture provides a good surface for the candy coating to form. Snowflake varieties pop in crazy irregular shapes and tend to capture powdered flavorings well. They also take up more space when popped which is why snowflake varieties are the standard for movie theaters, circuses, ballparks, etc. This is a wonderful recipe. I used Alton Brown’s quantities and made it in my Whirley Pop. I put all of the ingredients in at the beginning and stirred it all together before turning on the heat. I used a medium setting on my gas range and stirred nonstop, then removed it from the heat where there were a few pops still occurring. I liked this better than the much fussier caramel corn I made earlier in the month. I make mine in stir-stick popper, too. If you want a little extra bang, use unrefined coconut oil for another layer of flavor. I have also made it it with brown sugar, or sprinkled in a little cumin for a Latin-American vibe. As for clean-up, the lid is WAY easier to clean if you spray it inside with not-stick spray first. I make something similar (without the chili powder) in my electric automatic stirring popcorn maker often. It works very well, but clean up is a little more than normal popcorn. I generally need to soak the extra sugar off the plate and bowl. Would Turbinado / Raw sugar provide some added burn protection with its higher smoke point? Great Mobdro for COMPUTER is an impressive application that will certainly make us discover andenjoy a package of streams on various topics, in every language from all around the world. Fine. good Imo for Computer with ease and also your are couple of steps away from using Best Whatsapp alternative Imo carrier video clip calling app on Pc/Computer.nice. good This is normally accurately what You TV player can furnish. Away from this, the pursuing happen to be different features that You TV player has got to deliver that will offer you extra causes to download it:	nice. I just tried to make this… messed it up bad. Alton obviously expects that you have a large metal bowl and a gas flame. I have neither. I did it in a large pot on an electric range. I still think I could have gotten it to work out if I hadn’t also tried to double the recipe. That I think was the final fatal flaw. It was impossible to shake the pot fast enough to get the popcorn to mix properly once it started popping. Kernels ended up stuck to the popped corn. The bottom started to burn. I got it off the heat just in time. It was, I’d say, 70% edible. I could see how it was supposed to have turned out. I found individual kernels that were great. So my advice is to get the right equipment, and, barring that, at least stick with the given quantities and don’t try to scale it up. I am considering using clean bacon grease in place of the oil. I just made a variation of this – added about 1 tbsp butter, 1/4 tsp cinnamon and 1/4 tsp vanilla to the sugar and mixed it in before dumping it all in with the kernels – trying to make it a bit more “caramel” than regular kettle corn (or at least the kind I’ve had). Used a 5 quart pan with a thick bottom to help distribute heat, and put immediately into a big bowl At first it was way too hot eat, and then it kinda made a large bowl shaped lump, but as it wasn’t that much caramel, it easily broke up into individual kernels or 2-3 stuck together. I just tried this is my pressure cooker (unlatched!). It worked really well, although I had to kind of play my godforsaken electric stove by ear. The result is a pleasingly crispy coating. A bit salty for my taste; I’ll scale back the rock a bit next time. If you have a Whirleypop, add 1/4 cup of kernels, 4 tbsp of sugar, 4 tbsp of water, and 4 tbsp of vegetable oil. Medium heat and crank the lid until almost all kernels are popped. Don’t wait or your caramel will burn. Have a bowl read. Add salt or eat just plain sweet. Amish Country popcorn has an awesome mushroom popcorn…and tons of other varieties. It’s the only kind I get now, and no one is paying me to say so. It’s delivered fast and the price is reasonable. Pops up fantastic. 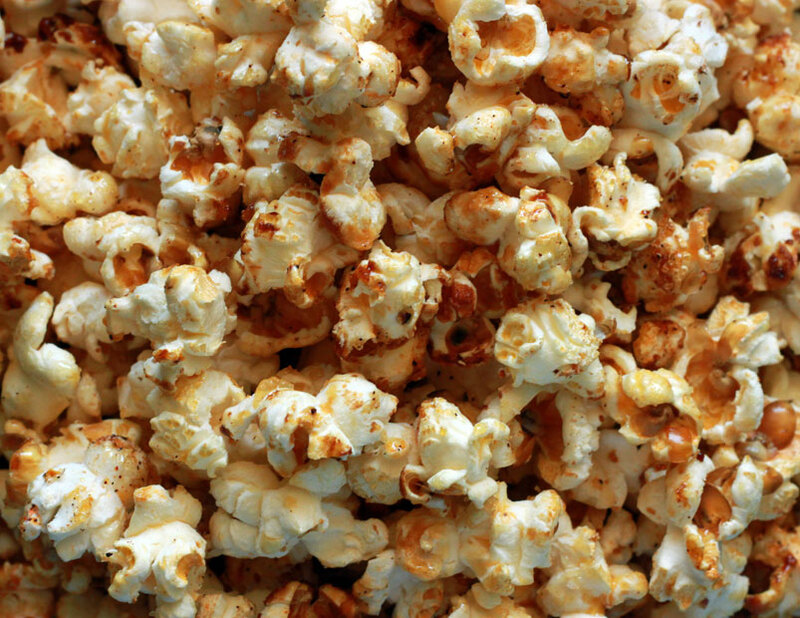 Cannot wait to try this recipe – kettle corn is a serious weakness! Would work well with my Whirly Pop instead of the metal bowl option? I know what I have to say has nothing to do with the recipe or method of preparation, but I did observe in the photo, two particular popped kernels… One takes the shape of a baby dragon, and the other of a mogwai-koala hybrid… I could not resist… I think it is cute! 🙂 As per usual, all your stuff is awesome! I make kettle corn at home all the time and it really is about timing. I set the eye just a little below medium heat put in the oil and about 4 to 5 kernels and lid it. When the 5th kernel pops, I add the rest of the popcorn and put the lid back on. I wait until I get the first couple of pops then quickly lift the lid and add the sugar and salt mixture. After this point, *never* let that pot, bowl, whatever stop moving. I actually toss the popcorn inside the pot to make sure it’s moving around and nothing is staying on the bottom. Finally, when the popping starts to slow, pull the pot off the heat *before* you think it’s completely done. Yes, you’ll have a few old maids, but you won’t have scorched sugar or burnt popcorn. Do you add the chilli powder? good For applying the site’s support initially of all you possess to sign-up to the Snapchat through your smartphone by installing the software and after that you will become capable to sign-up to the Snapchat online. nice. My popcorn popped, but the sugar turned into a smudge at the bottom of the bowl. Burned all the sugar before popcorn was done. What did I do wrong? In my experience, either your heat was too high or you weren’t shaking the container enough. Also, judging by the other comments, you need to stop *before* all the popcorn is completely popped. been trying to find this mushroom variety, is there a brand you are fond of, because i haven’t found any that say they are this type of popcorn? I will not claim to have an opinion – I have not purchased or tried it but Amish Country is a brand I see in my grocery stores and they have a mushroom type. The labels all look the same, it is just a sticker at the top which identifies the type – clear plastic bags, 1lb and 2 lb sizes. Online retailers have more brands available – use your favourite search engine to find “mushroom popcorn”.